GPM means Gallons Per Minute. Also known as “flow rate”, GPM is a measure of how many gallons of water flow out of your shower head each minute. Since 1992, a maximum of 2.5 GPM is the federally mandated flow rate for new shower heads. 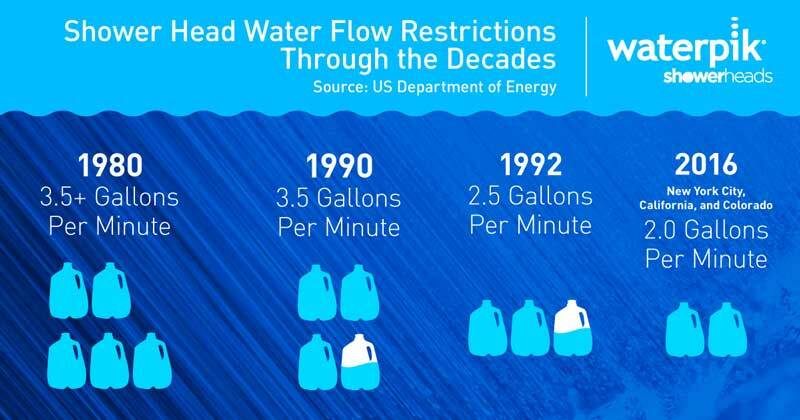 This means no more than 2.5 gallons of water should flow out each minute. The GPM flow rate for shower heads has decreased over time. If your current shower head was made in the 1980’s or 1990’s, its flow rate could be 3.5 GPM or more! 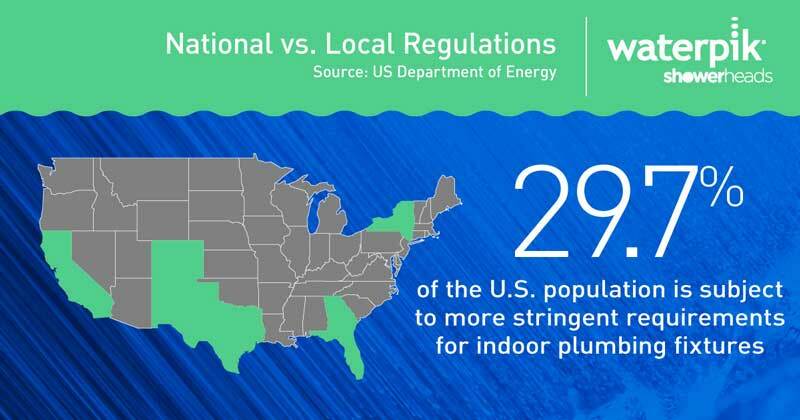 Federal, state, and local governments regulate shower head GPM flow rates, because the potential for water and energy savings are significant. A standard 2.5 GPM shower headuses 2.5 gallons of water each minute. That’s 25 gallons for a 10-minute shower. VS. A low-flow 2.0 GPM shower headuses 2.0 gallons of water each minute. That’s only 20 gallons for a 10-minute shower. Geert A. Buijze and his colleagues asked 3,000 volunteers in the Netherlands to finish their morning showers with a 30-, 60-, or 90-second blast of cold water, or to shower as they usually did, for 30 consecutive days. Then the researchers looked at the work attendance records of the same people over that period. On average, in all the groups that doused themselves with cold water, people were absent 29% fewer days than people in the control group. The researchers’ conclusion: Cold showers lead to fewer sick days. Dr. Buijze, defend your research. Buijze: This is the first high-level evidence showing that cold showers can benefit your health. People who took them for at least 30 seconds for one month called in sick 29% less than our control group — and 54% less if they also engaged in regular physical exercise. HBR: But why would cold showers make us less sick? This is a subtle but important point: Participants who took the cold showers actually reported feeling ill just as many days, on average, as the people who showered normally. But either their symptoms were less severe or they felt more energetic, so they were better able to push through the sickness and function anyway. The exact effect on the immune system is unclear, but we do have some knowledge of the pathway through which it works. Cold temperatures make you shiver — an autonomous response to keep your body temperature up. It involves a neuroendocrine effect and triggers our fight-or-flight response, causing hormones like cortisol to increase, shortly before we shift to a relaxation response. Moreover, cold temperatures activate the brown — or good — fat in the body. Brown fat doesn’t have any proven connection to immunity, but it does affect the body’s thermoregulation. When activated, it keeps the body warm by burning calories. It may also increase your energy and metabolism and help control your blood sugar. That could reduce your risk of obesity and diabetes. Cold temperatures trigger a fight-or-flight response. Couldn’t the cold showers just be producing a placebo effect, though? People feel tougher after starting the day shivering? We can’t rule that out, but even if this is merely a psychological phenomenon, that would be OK with me. The placebo effect has a negative reputation in medicine, but in life and health sciences, any salutary effect achieved by natural means, rather than a pill, is something to strive for. Placebos rely on neurobiologic pathways, too. But what about so-called presenteeism? Shouldn’t people who feel ill stay out of the office? Not necessarily, especially if their symptoms aren’t bad. Most of us will try to work through a common cold, for example. But we should take the necessary hygienic precautions — washing our hands, covering our mouths when we cough — to protect colleagues from pathogens. Why study cold showers instead of a more obvious health booster like exercise or diet? Previous studies have shown that physical exercise can strengthen the immune system, but I’m not aware of consistent evidence showing that any other daily rituals or habits do. Research on dietary supplements, for example, has yielded conflicting results. And while malnutrition can compromise your immune system, proof that superfoods boost it has been elusive. Cold showers interested us because there have been numerous claims — throughout history and across cultures — about their beneficial effects. Hippocrates, the father of medicine, prescribed cold baths for his patients. In ancient Roman times, one ritual involved moving through several rooms with increasing temperatures, then ending with a plunge in a cold pool — hence the Latin term frigidarium. You still see practices like this in spas around the world. Athletes take ice baths to reduce local inflammation and soreness and improve injury recovery times. Two-thirds of the people who took cold showers continued them after the study. We also took inspiration from the Dutch Iceman — Wim Hof, this guy who’s become famous in the Netherlands for using gradual exposure to the cold and breathing exercises to train his body to withstand freezing temperatures for up to two hours, and who has taught others to do the same. A recent study even showed that healthy adults can use those techniques to modulate their immune response when injected with a pathogen, leading to fewer and less severe symptoms. I was approached about coauthoring a book on cold showers — the writer wanted a medical expert on board — but I told him that I wanted to investigate their effect instead. So how cold is cold? We instructed our study participants to shower as they normally did — as hot as they wanted, for as long as they wanted — then to make the water as cold as possible for the prescribed amount of time. This took place in the Netherlands during the winter months, from January 1 to April 1, when the groundwater in homes’ wells was roughly between 10 and 12 degrees Celsius — which is really cold. It was a miracle that we had more than 4,000 volunteers, about 3,000 of which we enrolled. The duration of the cold shower didn’t make a difference. Were these people masochists? Or cold shower aficionados? Obviously, you can’t do a study on cold showers with people who would never consider taking one. But none of our participants had taken them regularly before. They were a mixed group of healthy adults, with no severe heart or respiratory problems. Some of them were probably inspired by the Iceman stories. Many told us they were afraid the experiment would make them miserable, and in the beginning it did. The vast majority found it uncomfortable, and some hated it, so they needed resilience to get through the month. As time went on, though, people started adapting and feeling less bothered. And when we asked if they would keep taking cold showers after the month ended, 91% said yes, and two-thirds did continue them. That, to me, is the most indicative sign of a beneficial effect — whether physiological or psychological. Taking a freezing cold shower is not something you do for pleasure. And 90 seconds of cold didn’t produce a stronger effect than 30? No, duration didn’t matter. The reduction in sick days was the same across the 30-, 60-, and 90-second groups. It’s possible you could do less than 30 seconds, but for now we know that’s enough. Were there any benefits beyond fewer sick days? Productivity while at work was the same regardless of cold showers or none, although theoretically the cold shower people were cumulatively more productive over the study period, since they were absent less often. And though we saw an early improvement in self-reported quality of life for that group, that effect disappeared over time. Is it possible the sick-day effect would go away over time, too? Maybe. But I think that even if you became habituated to the cold water, so you felt less discomfort and shivered less, the neurobiologic effect would remain. Could I achieve the same result by moving to Newfoundland? I think not, because we modify our behavior to fit the climate around us. If you’re living in Canada with regular temperatures of minus 20 degrees Celsius, you heat your house, car, and office, and when you’re outside you layer up so your body stays at 37 degrees Celsius. Perhaps if you exposed yourself to the cold and created the same shivering effect, it would help, but we don’t yet have any data to support that hypothesis. At what temperature do you shower? My preferred style is like that of James Bond in Ian Fleming’s novels. I alternate temperatures, starting with a steaming hot shower and shifting straight to freezing cold. Have you noticed any changes since you started this regimen? My experiences have been comparable with those of the participants. Once you adapt and get resilient, it becomes an addictive energetic morning challenge. Whether you feel ill or healthy, a cold shower kick-starts the day!